The chalet was originally built, to our design, in the early 1990’s and was fully refitted and renovated in 2009, with refined style and sophistication. The interior is extremely spacious and we have furnished with your every comfort in mind. There are now 10 beds in 4 twin or double, en suite, bedrooms, two of which have extra beds. All the bedrooms are on the top floor however, downstairs, the games room can also be used as an additional double bedroom and there is an additional shower room. The rest of the first floor comprises a large living room with TV; dining area with a table which can sit up to 12; a practically designed kitchen; and a large well equipped TV (2nd) /games room. Large picture windows lead out from the living room to a balcony from which you can enjoy our spectacular views. There are hardwood tables and chairs for 'al fresco' dining in the summer, together with a barbecue and parasol. The outdoor hot tub/jacuzzi can be accessed from both the balcony and the games room. Skiing: In winter, as well as skiing and snowboarding, there are ice skating and snow shoeing. Les Gets is part of the immense Portes du Soleil ski area and has an excellent snow record. Plenty of ski schools provide excellent tuition in a variety of languages and make the resort extremely attractive to families. Golf: Les Gets has an 18 hole golf course. In the heart of the Portes du Soleil, in wooded surroundings, the Les Gets Golf course has each hole named after the nearby peaks: with Mont Blanc or the 14th hole being the most impressive of this line up. Although not in the centre of town we have a fabulous position with superb views in a safe peaceful environment. Travel: We are only just over an hours drive from Geneva airport. During the winter there are many options in terms of airline and departure airports in the UK. We are 8 hours drive from the Channel Tunnel. For your satellite navigation, the coordinates of the chalet are: N 046? 09.038' E 006? 38.874'. The motorway tolls from Calais to Les Gets currently amount to around 85 euros. Quiet dishwasher with short and longer settings. Large refrigerator with lots of room for a large family. Fan assisted and normal convection oven with grill facilities. Starter pack of essentials - milk, juice, flour, sugar, butter, jam, bread, eggs, tea, coffee, cereal, salt, pepper, washing liquids, cloths, snax and a bottle of wine!! Adjacent to the open plan kitchen. We stayed for 7 days at the beginning of February this year, and had the most amazing holiday. Joanna was a great host, and we very much enjoyed our flexi-catering evenings with her wonderful cooking. And the cakes.......... heavenly. The portions were huge, so if you get hungry after skiing this is definitely a must. The chalet is very well-equipped and it was lovely to relax in the hot-tub after a day of skiing with a glass (plastic) of prosecco whilst it snowed. All 4 bedrooms were spacious, with good clothes storage, all ensuite with endless hot water. We really have no complaints and are definitely considering a return next year. 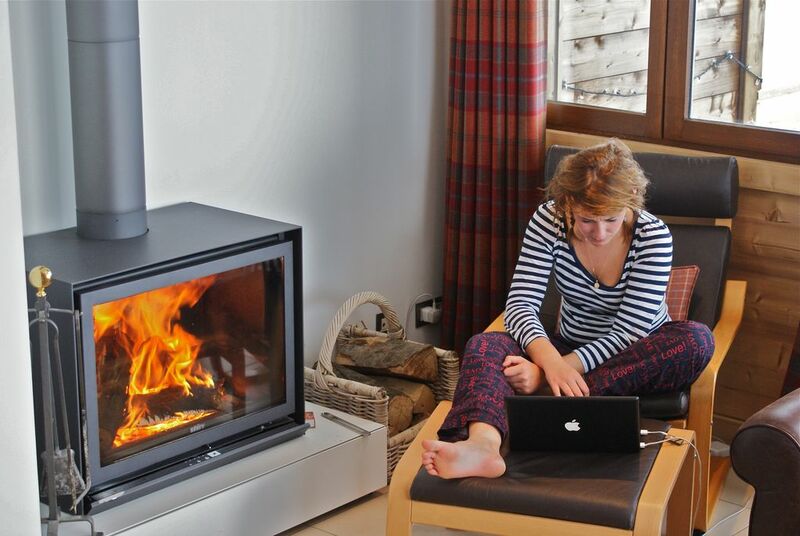 The living space was prefect for our 2 families to enjoy and it was lovely to light the fire and relax on the sofas whilst watching the snow-ploughs get to work in the ski-runs across the valley. Thank you for a wonderful stay. Give Marmite a big hug from us all. Harrison so enjoyed playing in the snow with him. This was our 3rd trip to Les Gets and it was by far the best. A fantastic chalet, very warm and cosy, the beds were so comfortable. We choose option B and had two great meals and cakes. The hot tub proved very popular with everyone. I would definately return to this chalet if we go to Les Gets in the future. Seven of us stayed in this great chalet. The chalet is very well looked after. Nice bedrooms with good beds. Attractive bathrooms, not big but more than adequate with plenty of hot water. The jacuzzi was used every day. Lovely to lie back surrounded by fresh snow and enjoy the beautiful view. The owners Peter and Joanne were very friendly and helpful. Kitchen was very well equipped with plenty of cutlery, glasswork and crockery. Only one criticism, it would have been good to have more than just one large saucepan, but we managed. We mainly used our own cars but two in the party made use of the bus on a couple of occasions and found the service convenient and within easy walking distance. All in all a great chalet which I would certainly recommend. This truly wonderful and well appointed chalet far exceeded our expectations. The hosts' careful attention to every detail made for a very comfortable stay and we would certainly like to return again. We couldn't think of anything that hadn't been provided and the bath robes, towels and beds/bedding were all very luxurious. The separate TV room and DVD collection were a great hit with the kids (as was the hot tub) and the sitting room, with the lovely fireplace and great views, was a great hit with the adults. The chalet is close to the very attractive resort of Les Gets and also very accessible to the other resorts in the area. The hosts were very helpful in advising us where to get the best ski hire deals. 6 of us stayed at this luxury house, Chalet Tressud. The house is immaculate, contemporary, spacious - each bedroom has its own en-suite facilities. The house is 1.5 km from town. Les Gets is briilliant. We opted for the part catered solution, enjoying both the luxury of going out and staying in......we highly recommend it!! My family and my sisters' family had the most wonderful ski holiday at chalet Tressud. The accommodation was superb, and the hosts excellent. Set at 1200m altitude you are sure to be charmed by the town's traditional mountain village atmosphere and Savoyard wood and stone chalet architecture: no modern appartment blocks here. Les Gets dates back to the 11th century and the name Gets comes from the ancient French word 'jets' - meaning the gaps in the trees down which wood was brought. The wooded lower slopes and the high mountain scenery with views of Mont Blanc and surrounding peaks are breathtaking. All rentals are from Saturday to Saturday. 10% discount second week. Once we've fixed the date, we'll hold the week for 7 days while you complete the booking form and send us the security deposit of £350. After the deposit is received the booking is confirmed. The holiday rental price will be invoiced and is then payable 8 weeks before the start of stay.